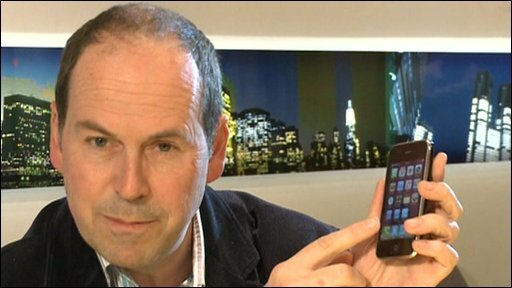 Rory Cellan-Jones has a look at Skype's new application to make calls over the web from an iPhone. Skype has said that iPhone users will be able to use its internet telephony service to make calls, but only using wi-fi and not the mobile network. The firm's native voice over internet protocol (VoIP) application - Skype for iPhone - will be available for download from Apple's iTunes store on Tuesday. 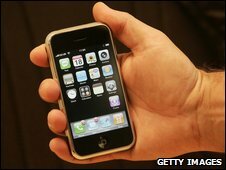 The new service will allow users to make free calls to Skype users, but will charge for calls to other numbers. The UK's first Skype handset was launched by network 3 in 2007. Rival applications from Fring and TruPhone are already available for the iPhone. On Monday, TruPhone announced a flat rate charge of £25 a month for unlimited Voip calls to mobiles and landlines in 64 countries. Unlike traditional mobile calls, which are transmitted over a cellular network, Skype turns your voice into data and sends it over the internet. Some mobile Voip applications allow users to make internet telephone calls over wi-fi and the cellular network. In the case of Skype, while calling another Skype user will be free, calling an actual phone number via the service will incur a cost. iphone users will not be able to make Skype calls, either to Skype contacts or to landlines, over the mobile network, something users of Skype on the UK mobile network 3 can do, and have to use a wi-fi hotspot. Many of Skype's other features - such as video conferencing and the ability to receive a second Skype call - have been left out, although the firm did not rule them out in the future. "We're considering video carefully but we have a really high bar on the quality," said Skype's chief operating officer Scott Durchslag. "If we do it we will have to do it incredibly well." Mr Durchslag said he had high hopes for the application. "The number one request we get from customers is to make Skype available on iPhone," he said. Skype plan to launch a service for BlackBerry users in May.